Medium to tall shrub, 1-4 m tall, from extensive rhizomes, often thicket-forming; stems erect to arching, unarmed to strongly bristly, especially below, the bristles short and straight; bark yellowish-brown, shredding. Alternate, deciduous, pinnately compound, 7-22 cm long; leaflets 3, egg-shaped, 3-15 cm long, shallowly lobed and double-saw-toothed, sharply long-pointed at the tip, greenish on both surfaces, smooth to sparsely hairy above, paler and hairy on the veins beneath; stipules linear, 5-10 mm long. Inflorescence of mostly 1 or 2 stalked, nodding flowers on short, leafy, lateral branchlets; corollas rosy red to reddish-purple, bowl-shaped, the petals 5, spreading, elliptic to egg-shaped, 10-25 mm long; calyces hairy, 5-lobed, the lobes lance-egg-shaped, spreading, 7-15 mm long; ovaries superior; stamens 75 to 100. Drupelets, smooth, more or less coherent in a yellow or salmon to dark red cluster that falls intact from the semi-fleshy receptacle (raspberry-like), the berries 1.5-2 cm long. Moist to wet forests, swamps and streambanks in the lowland and montane zones; common in coastal BC; N to AK and S to CA. 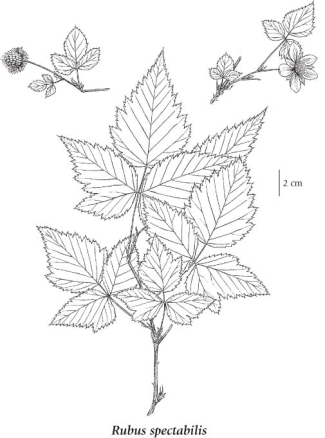 A shade-tolerant/intolerant, submontane to subalpine, Asian and Western North American deciduous shrub distributed more in the Pacific than the Cordilleran region. Occurs in hypermaritime to maritime cool mesothermal climates on very moist to wet, nitrogen-rich soils: its occurrence increases with increasing precipitation and decreases with increasing elevation and continentality. Very common on water-receiving (floodplain and seepage) and water-collecting sites; tolerates fluctuating groundwater tables. Often dominant in early-seral communities where it hinders natural regeneration and growth of shade-intolerant conifers. Usually associated with Alnus rubra, Athyrium filix­femina, Lysichitum americanum Oplopanax horridus, Rubus parviflorus, and Tiarella trifoliata. A nitrophytic species characteristic of Moder and Mull humus forms.